Medication adherence is becoming increasingly more difficult for the average patient. VIDEO. New monitored medication management tool, e-pill MedSmart PLUS. MedSmart is a system that organizes, reminds and dispenses pills in accordance with prescribed treatment regimens. With MedSmart's event reporting and notification option (e-pill MedSmart PLUS), family caregivers and healthcare professionals can monitor a clients adherence to their medication regimen. MedSmart's docking base serves as the gateway for remote programming and event reporting. When connected to a household phone, MedSmart transmits device and dispensing history to a secure server supported with a web application for review by authorized individuals. Through the personalized notification system, alerts can be sent to track adherence, address dosing errors and predict refill requirements. The e-pill MedSmart is also available Without MONITORING. e-pill MedSmart PLUS includes an innovative event reporting and notification option, family caregivers and healthcare professionals can proactively support independent living. The standalone version of e-pill MedSmart can be 'upgraded' to monitoring, by purchasing a docking station (call 1-800-549-0095 for a price quote) and by paying a monthly fee ($49.95 per month / minimum 3 months). MedSmart's included docking base ('docking station with modem') serves as the gateway for remote programming and event reporting. 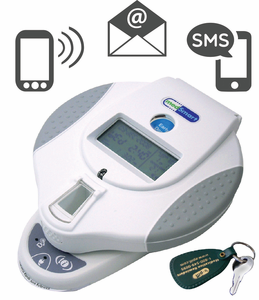 When connected to an active phone line, MedSmart PLUS transmits device and dispensing history to AMAC's secure website, using a toll-free number, for review by authorized individuals. When pressed, a signal is sent to the Data Center and a help notification is sent to the designated recipient.